Shutgun Tool has decided to showcase their newly released fire sprinkler shut off products at this year’s BUILD EXPO USA taking place September 16 & 17 at the NRG Centre in Houston. The Shutgun system was designed to respond to emergencies, therefore it needs to be accessible at all times. Ideally, we recommend that you place your equipment in a highly visible, labeled location. But let’s face it, sprinklers don’t discharge every day. So, it is easy for the equipment to be inadvertently placed into a toolbox or into a drawer. When your sprinklers are accidentally discharged, the last thing you need to worry about is finding your Shutgun. Scrabbling in a drawer or a toolbox for the shut off system increases the risk of damage. Time is of the essence. Purchasing the Shutgun is the first step to ensure quick shut off occurs, but what if you can’t find the equipment? We have an opportunity and would like to share it with you! As part of exhibiting at the upcoming Greenbuild International Expo and Conference in New Orleans, LA Oct.22-23 - Shutgun is giving away 150 free EXPO passes to our friends, distributors and customers. Simply use this link below with the already pre-entered code, and you can register and attend for $0. Go to: https://www.compusystems.com/servlet/ar?evt_uid=229&company_code=TECH1PG635 and complete the registration process. You're welcome! And don't forget to stop by our booth #3049! We're very thrilled, for a couple of reasons, to be heading to Hawaii later this week in order to not only exhibit at the Hawaii Lodging Hospitality and Food Service Expo on July 9 and 10 (Booth 219) but to take time and visit with as many of our valued hotel clients as possible. We will be promoting our #OneOnEveryFloor campaign in order to bring awareness to the cost and time saving benefits of having multiple Shutguns accessible on your hotel or resort property. Still think you are covered with just one Shutgun at your front desk or fire panel? Think again... we did the math! CHECKLIST – for engineers, safety managers and risk managers. Property owners and managers can reduce the possibility of extensive losses through a water damage mitigation program. The program involves a detailed checklist specific to your facility. This analysis gives risk managers, safety managers, building engineers and other professionals more control over potentially paralyzing situations. Recently, Shutgun chatted with Thomas Riegelman, VP of Engineering and Facilities Management for White Lodging properties about his experience in placing the Shutgun Water Protection Kit into over 170 of his properties. Shutgun has made changes to our online shipping transactions to benefit you, the customer. We're thrilled about the new look and feel of our website and we pride ourselves on focusing on one thing and doing it RIGHT - Shutgun, shuts off activated fire sprinklers, fast! Saving you time, money and headaches. Our product is safe, reliable and easy to use, and we are committed to showcasing our website in the same way. We hope you enjoy navigating our updated content, videos, events and resources, as well as browsing our full range of products. Also, don't forget to sign up for our industry newsletter using the new button on this page. Preparing the fire, construction, hotel and building management industries for fire sprinkler emergencies since 2009. There was no rest for Shutgun early in the new year, as it was on the scene of a sprinkler head-related accident on the morning of January 9th at a hotel and country club in Collingwood, Ontario. Shutgun saved significant water damage to the site. Patterson adds that the residual cost of damage from an accidental activation of a fire sprinkler head is estimated at up to $1,000 for every minute water is left flowing and suggests one shutgunfor every fire box, on every floor. On his way he'd bump mantles and stockings and trees! Santa spun around to see what was the matter. Santa knocked over a ladder, and broke the sprinkler head! if this water didn't stop soon it would be a Christmas flood! he had Shutgun on hand to plug the sprinkler head. and giving the handle a squeeze, off the water went! In an effort to save on insurance premiums, an increasing number of hotel properties are hiking deductibles to save cash. While the property owners save dollars month to month, they are assuming more responsibility for every minor incident or repair. Experts point out that in cases of water damage and sprinkler-related accidents, the resulting expenses could spiral out of control and owners are best to prepare for these ‘minor’ cases ahead of time, or risk being on the hook for thousands of dollars in damages. Gregory Orndorff is with A-1 Flood Tech and has witnessed firsthand the harmful effects of water damage. Hotel owners know all too well that accidental fire sprinkler activations come with the territory – whether it’s a rowdy guest hitting or damaging the sprinkler head or a bride using it as a garment hanger, the result is a torrent of dirty water flowing from a pipe at rates exceeding 25 gallons per minute. Russell Poste, brings up another concern in situations where guests are displaced. The following are exerpts from an interview with Samueal Askew, General Manager, Tulalip Resort & Casino Tulalip, WA. How did you hear about Shutgun? I was introduced to Shutgun at the IHMRS Show in NYC in 2012. I was really impressed by the product itself, the presentation of the materials, and the service. My purchase was made then. How many Shutguns have you purchased? 24 units total. What was the decision behind your purchase? The quality of the Shutgun is extremely high -Well made. It’s also easy to use and requires little to no training to respond to an emergency. But the greatest decision point was the fact that it contained a fusible link so that if it is used in an emergency, the sprinkler system will in turn still function if there is another incident. How have you found the Shutgun useful to date? Absolutely! We had new housekeeping associate dusting in and around the laundry room and broke a sprinkler head. The Shutgun was quickly at hand and saved us from many many hours of cleanup, work, and of course limited damage to the facility. What was the best feature for you in using Shutgun? Aside from the Fusible Link, the fact that ANYONE can use it at ANY TIME means that our team members can respond to a situation at a moments notice. The local fire depart loves them and are placing orders too! MacKenzie Ridge Terraces, in Vaughan Ontario, is the first production home project in Ontario to include sprinklers as a standard feature, which fire departments and insurance companies have been advocating for years. They will equip 136 executive townhomes and six semi-detached homes, with a fire-suppressant sprinkler system in each room plus a heat detection system installed in each garage and wired into the home’s smoke detector alarm system. In addition, Co-operators Insurance has offered purchasers at Mackenzie Ridge a 10 per cent minimum reduction in insurance premiums because of the sprinkler system. Fire alarms and other fire safety features has opened the home insurance company to consider further premium discounts. "This advocates what we have been encouraging for years," said Greg Patterson, "Which is to give incentives for building owners and residents who add fire safety measures and equipment to their fire safety plans." John Caruso, Vaughan’s fire prevention officer, said 15 per cent of house fires in Vaughan last year started in the garage. Click here to read Toronto Star article. On the heels of the Kerry Rose Fire Sprinkler Notification Act signed by governor Cuomo on July 25, Shutgun is issuing a Sprinkler Awareness Challenge to all New York College Campuses to enhance awareness among students and staff on proper sprinkler use and safety. “This bill has heightened awareness around fire safety on college campuses,” said Greg Patterson, engineer and President of Shutgun. “We are challenging campus operators to take this bill one step further with our sprinkler awareness challenge." Shutgun’s Sprinkler Awareness Challenge will offer a free Shutgun tool, along with demonstration videos and fire sprinkler FAQ document to every college campus in New York State. Managers can enter here to receive their free kit by mail. If interest persists, Shutgun will consider extending this offer to other Canadian and U.S. regions. Though accidental fire sprinkler activations are rare, there are several well documented reports of sprinkler floods in college dorms. The results range from thousands of dollars in water damage to hundreds of displaced students with disrupted schedules. The Top examples of accidental sprinkler head activation in college dorms as; Hanging Clothes (and other items) from the sprinkler head; Soccer balls; and Frisbees! View a list of top college dorm sprinkler flood videos on twitter at #Shouldahadashutgun. President of Technicraft Product Design Inc., and co-inventor of Shutgun, Greg Patterson, was recently featured on a popular Business Podcast discussing Shutgun and its decision to go international, checklists for businesses working with distributors and the quality measures he has taken with his Canadian invention. Click here to listen to the interview here. “Although we have the product made in China, we ship materials from Canada to use to ensure good quality. "I have built great relationships in the last 30 years with China so problems that other manufacturers have with using parts made in China, we’ve been able to avoid. “In 2007 the international fire sprinkler association estimated that the annual installation of fire sprinkler heads globally was 117 million. Only half of those were in north America. “Since 2010, we now have distributors in US, Canada, UK, Europe, Middle East, South Africa, Australia, New Zealand, Hong Kong, Vietnam, and we’re always looking for more! "The biggest surprise has been the value that various countries put on a life. Consequently, certain countries don't require sprinkler systems where we would." BAY CITY, MI — Firefighters responded to report of fire at Bay City's Boathouse condominiums on Saturday, July 13, but found themselves dealing with a cascade of water instead. At about 1:30 p.m., part of the sprinkler system inside the five-floor building at 1111 N. Water was activated. That apparently caused a large pipe in the building's foyer to burst, sending a cascade onto the floor, officials said. Shutgun is pleased to expand on its international customer base through Total Fire Protection B.V. who is our distributor in Europe and Middle East. They have purchased additional 16 cases (or 640 shutguns) for their stock. Shutgun looks forward to assisting TFP who has been our distributor since August 2011 and have been a valued partner along with our other foreign distributors. With a current national resurgence of bed bugs, along with a decrease in effectiveness of treatments such as chemicals and pesticides, pest control companies are relying on a new technique called Heat Remediation to scourge the unruly pests. The process relies on piping hot air into the room and heating its core temperature to 120 degrees Fahrenheit (48C) or higher, causing the bugs to inevitably reach their thermal ‘death point’. While proven effective on bed bugs, the process of heat remediation does not come without its own fire and safety risks to the building’s sprinkler system. With heat remediation, it would take approximately 20 minutes heated at 46C to kill adult bugs, and over an hour to kill their eggs. “With temperatures reaching above 100 degrees Fahrenheit, there is concern that the sprinkler heads could potentially be damaged or set off by such an increase in temperature,” said Eli Scardoni, former Toronto District Fire Chief. “To avoid damage, it is standard practice to cover the sprinkler heads with insulated boxes while the temperature is closely monitored. However, it is wise to always have a backup plan in place in case the sprinkler is set off by the heat,” he said. 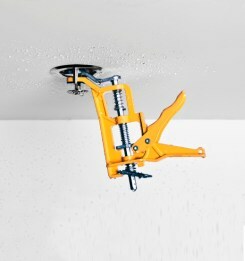 Shutgun is a one handed tool designed with a unique fusible link that will melt and release in a case of fire flare up allowing the sprinkler to operate as normal. This means it can be left in place and the building’s fire sprinkler system remains fully operational. For more info on a University of Kentucky study to test concept of heat to remove bed bugs from hotel rooms, click here. For article by National Fire Sprinkler Association and Westfield Insurance on threat of heat remediation to sprinklers, click here.